Celebrity couple Coleen Garcia and Billy Crawford had another prenup photoshoot, and its driving social media into a frenzy. The photos taken in Ethiopia are getting a lot of flak for being racist and politically tone-deaf. Of course, people online have split into two groups in reaction to this criticism faced by the would-be husband-and-wife. Some think the photos should just be appreciated for their beauty and the rest of the world should stop being hypersensitive. Others think that the photos were made in bad taste and should be called out for being ethically questionable. In an attempt to end the commotion, Billy Crawford released a statement addressing his and Garcia’s critics and giving more context about the nature of the shoot. The couple’s supporters are taking Crawford’s explanation as proof that there was absolutely nothing wrong with these pictures. It was all just a matter of context. Case solved. We, on the other hand, have some points of contention. Fair enough, this explanation does shed some light on the whole matter. It lessens the blow (to some extent). At least, now, this entire thing doesn’t just come off as an exercise in opulence on the couple’s part. But, as much as Crawford expressed his dismay that their photos were taken out of context, maybe it’s better if he recognized the fact that their team is also accountable as to why said taking out of context even happened in the first place. Because you know what’s easy to take out of context? Things that don’t offer it in the first place. The couple’s photos first came out on Metrophoto’s, the studio responsible for this whole mess, official Instagram account. In their posts, they only mentioned the airlines with a passing “special thanks to @labellefete, @ethiopianairlines.manila, and @theweddinglibraryph.” There was a distinct lack of acknowledgment from the team and even the couple. No statements explicitly stating that these photos serve a purpose other than their own, and that said purpose is to promote an entire country. I don’t know about you, but if you were doing something to promote the tourism of a country, stating as much in the caption of the photo or the social media post seems like a pretty crucial thing to do. After shedding some light on the true nature of their photoshoot, Crawford went on to defend their intention versus the meanings imposed upon them by the public. Alright then, let’s talk about these intentions in contrast to their execution. First of all, we’ve got the aforementioned intention of promoting Ethiopia’s tourism. The very fact that Billy Crawford has to point out that this is the reason they did the shoot is in itself proof that there could’ve been more done to let the people know that this isn’t just about a rich and famous couple’s vanity. It was first and foremost about another country. Yet, here we are. Secondly, the execution of the photos fails to “capture [Ethiopia’s] natural environment.” When you look at these photos, your eyes are immediately directed to Crawford and Garcia alone. They are highlighted and isolated as the only objects in the picture worthy of attention, while their surroundings are blurred and cropped out. As it is, they could’ve done this photoshoot anywhere else, even here in the Philippines and there would’ve been no significant change. 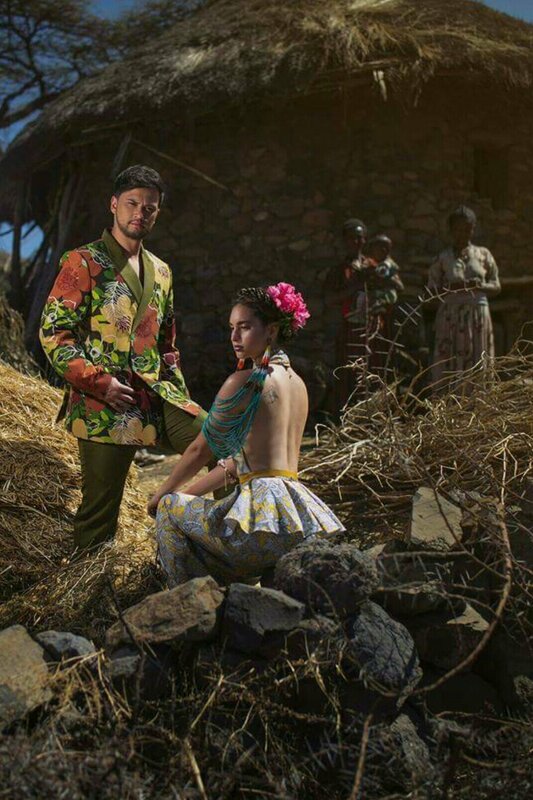 The purpose of the photoshoot was to let the world (or the Philippines at the very least) see Ethiopia. And it did that, but only in the literal sense. Not one shot from this collection allowed the viewer to see what makes Ethiopia such a unique country. Not one shot entices the viewer to learn more about Ethiopia or to explore the country’s culture and its people. Lastly, the spontaneous shots with the children could’ve been done better. Crawford explained that the kids “really wanted to be part of the photo so they kept coming into the frame.” Alright, fine. Those three specific controversial photos were born out of a moment of spontaneity and they got the approval the locals before and after they took the pictures. Still, you cannot deny the fact that these photos will from its moment of publication deliver its own message, separate from the couple’s initial intention. And that message? It doesn’t speak of the warmth or the happy experience that Crawford and Garcia’s team had in Ethiopia. It doesn’t speak of the people’s hospitality there. 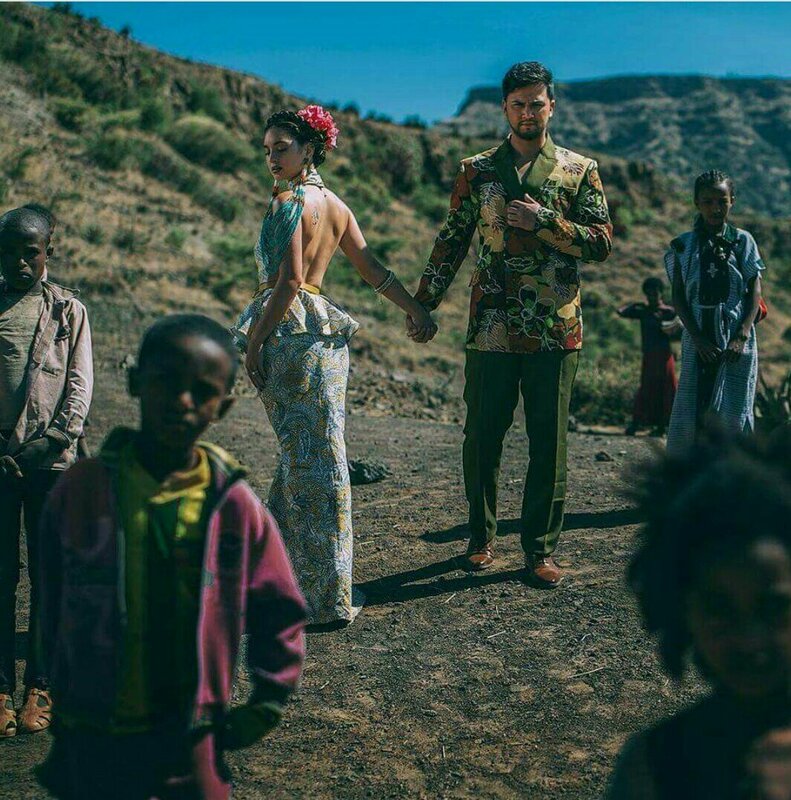 It doesn’t speak of much else but this one beautiful couple standing in front of poor blurred out children of Africa. Those kids, the mother and child, and those two priests wanted to be part of the photos, and Crawford’s posse indulged them. But, again, only in the literal sense. Aside from serving as props or a backdrop to the celebrity couple, these people weren’t really allowed to be a part of the photo. No interactions, no reactions, no recognition that they weren’t just stray subjects in the background. They were people too. And again, these are the people that the shoot was supposed to get us interested in in the first place. An example of how this whole thing could have been done better is Maggie Wilson’s photoshoot with the Maasai tribe. See the difference? She was still the highlight, but the photographer managed to incorporate other subjects too. Here, we have Crawford patronizing their critics and dismissing any valid criticisms their prenup shoot are facing. We honestly just don’t care for it. Some silver lining. As far as celebrity “apologies” go, Crawford’s can be commended for actually recognizing that they may have done something wrong. But, one small pointer. We’d just like to clarify that yes, it is about the photos. And yes, it is more on how these photos come across and what they represent.